RAMP UP PENINSULA is a festival honoring the ramp, the wild leek, the ramson, Allium tricoccum also known as “little stinkers” by some folks in the Cuyahoga Valley. Appalachia for decades. Ramps flourish in leafy mulch in hardwood forests. Their leaves appear briefly in spring providing much needed minerals and vitamins to foragers and appreciators alike. Their strong garlic and onion flavor is rich, earthy, lingering and not like anything else. 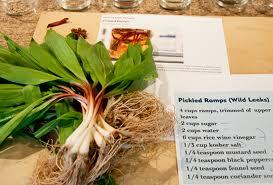 Ramps, Ramps and more Ramps! and of course the Midwest Native Skills Booth!